if Jesus actually joined your coaching sessions? Imagine if every appointment was a three-way call instead of just a dialogue between you and your coachee. Instead of looking for answers within, you could simply ask Jesus and he’d tell you straight up! Coaching the Heart will teach you how to do just that: help your clients have life-changing, live dialogues with Jesus, right in your coaching sessions. Coaching the Heart is about doing heart change by letting Jesus speak to the person’s emotions, beliefs and desires. It’s transformation, not behavioral modification. For instance, when your client identifies a belief, instead of thinking it over you’ll go straight to Jesus and say, “Jesus, here’s what I believe: ____. What do you think of my belief?” And Jesus responds, with amazing insights that realign the heart as well as the mind. We’ll teach you to hear God this way yourself, how to formulate and direct questions to Jesus, and how to build an atmosphere of belief where people find it easy to hear God’s voice. You’ll learn to help coachees take their biggest unanswered questions to God and get answers, and how to troubleshoot effectively when people say they aren’t hearing anything (hint: usually they have—they just don’t believe they have). If you’ve wanted more impact as a coach, if you’ve wanted to go deeper with people, if you’ve wanted your sessions to bring both wisdom and a supernatural touch from God, this course is for you! 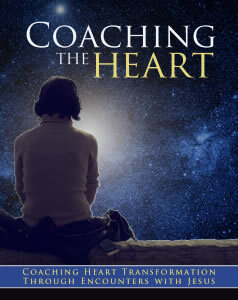 Coaching the Heart begins with a three-day, practical workshop that focuses on learning a skill and then practicing it with peers and receiving specific feedback. The event is followed by eight weeks of structured peer coaching sessions that give you additional practice (while helping you accumulate coaching hours toward a coaching certification). A course manual is also included. To attend this course, you must have either completed our Transforming the Heart course or read the book, The Invitation. (You'll be lost without it!) To find out what's on the calendar or to sign up for a course, visit the MetaFormation Registration page. From a coaching client, the first time the coach tried using Coaching the Heart: "I´ve always wanted God to speak to me but never thought he would and here he is doing it and it´s so easy and fast!" "Wow--this stuff works! And I'm using it again and again..."
"This training (and the open hearted way you taught it) has touched me deeply and in turn, my clients are being touched deeply - not to mention heart chats with my husband, daughters and spiritual sons and daughters in other nations."